Lahore: A civilized nation is known by discipline on roads and drivers equipped with road safety rules and regulation would largely help in bringing discipline on highways with ultimately result into lower accidents ratio said Inspector General Motorway Police, Muhammed Saleem Bhatti while inaugurating road safety theme park at Babu Sabu, Lahore. The DIG, N-5 Central Mirza Faran Biag, DIG Ashraf Zubair Sadique, SSP Ghulam Jaffer, SSP Masroor Alam Kolachi, SSP Ather Waheed , Sector Commander Abdul Khalil Patrolling officers and Children from different educational institutions were also present on the occasion. 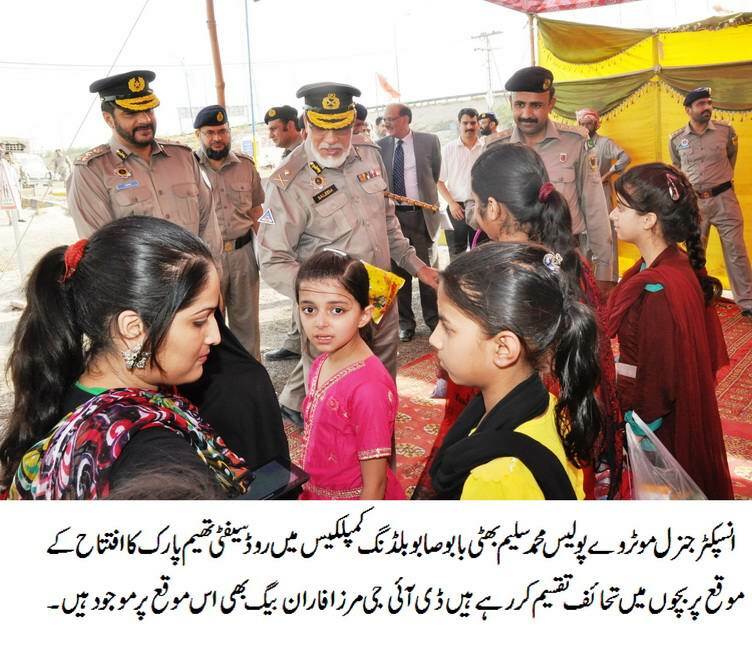 IG Saleem Bhatti said road safety theme park would contribute to the road safety awareness from early age among Children. It also offer a series of road safety educational activities that were designed so as to enable students to experience road safety through the learning of the different roles of the road applicable to their age , such as transported passenger , pedestrian and driver , he added . IG Saleem Bhatti said the road safety theme park offers a series of road safety related educational activities that would contributing in order to raise educational awareness from childhood, to reduce road accidents and lessen the economic and social impact they generate. In pursuance promoting the cause of road safety NH&MP has established road safety training school (driving school) all over Pakistan especially in remote areas at all major districts, he added. He emphasized that youngsters are our asset and road safety theme parks will also be established to create awareness among them. He also appreciated the efforts of Zonal Commander DIG Mirza Fran Baig while making positive and fruitful efforts to establishing theme park.